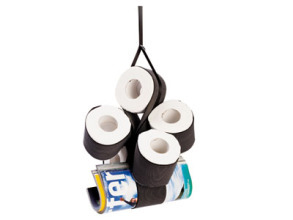 Tired of your bathroom looking like the day after Halloween at Larry David's house? Of course you are - and the Daisy Roll Holder was designed to get those rolls looking pretty, pretty good. 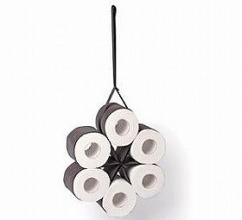 The Daisy Roll Holder from Japan's Fancy Sale is sort of like a Snuggie for toilet paper. It gets it off the floor, out of the closet and out in the open within easy reach. It might even keep it warm, if it's hung near a heater, and out in the open it won't get damp or mildewy (don't you just hate that?). You can even slip a magazine or two into an empty slot, how thoughtful. Best of all, it holds up to 6 rolls so you're never in the unfortunate position of having to ask someone to spare a square. 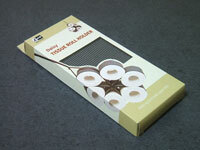 Curiously, the Daisy Roll Holder is designed especially for non-Japanese toilet paper. It seems that foreign tissue rolls are more than 4 inches in diameter - the perfect size to fit in this glorified sling. Either the manufacturer is export oriented or they figure nobody from Japan would be caught dead with this thing swinging in the breeze. The Daisy Roll Holder sells for 2,280 yen (about $25, yikes! ), is packed in a pretty cardboard box and is made from 100% cotton, which is good to know if you're exceptionally lazy and actually do use up every roll. Mark Zuckerberg, Social Media's Howard Stern?